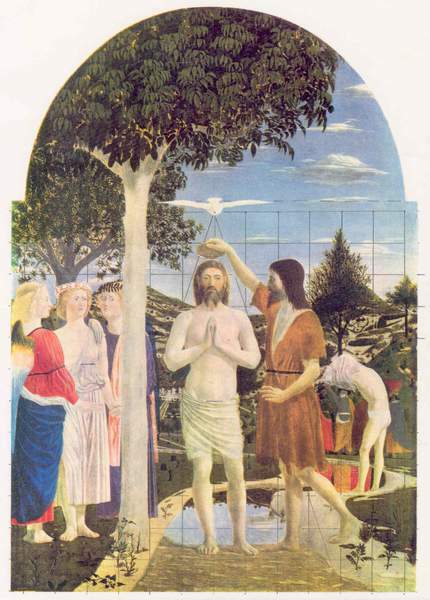 A visitor standing in the former refectory of Santa Maria delle Grazie will see the large figures of Christ and his twelve disciples painted high up on a wall, set in a virtual prolongation of the room itself and seated in a row behind a long table positioned horizontally to the space. Jesus is in the center, six and six disciples by his sides. From left to right: Bartholomew, Jacob, Andrew, Judas, Peter, John, Christ, Thomas, Jacob the Elder, Philip, Matthew, Simon, and Thaddeus. Jesus has just announced that one of those present will betray him. The men have sprung up, bent forward and leaned backwards, turned towards and away from each other, in this way forming four distinct groups of three men each. Who would betray the Lord? Although the name of the traitor has not been uttered aloud, the disciples look and point toward Judas - as if revealing him in a subconscious manner. Matthew, Thaddeus and Simon are all indicating him directly. Philip has jumped up and points at his own breast, as if saying: Look at me, my sweet Lord, I could never betray you! - while gazing in Judas’ direction. Thomas, too, is looking at Judas, while raising his right hand in a menacing manner. Jacob the Elder leans backward, opening his arms in disbelief and gazing at the bowl between Christ's right hand and Judas' left (it was by dipping his bread into this bowl that Judas would reveal himself as the traitor). Bartholomew, Jacob and Andrew have their eyes on the back of Judas' head. Andrew has his arms raised - as if to protect himself against him. John is leaning toward Peter with his eyes closed; if he opened them he would have to look directly into Judas’ face. Jacob is reaching out for Peter’s arm, and seems to be pointing at the back of Judas' head (an action evident only in the shortened projection of the virtual room onto the wall. A picture, however, lives from allusions). Peter turns towards John and asks him for the traitor's name; he even pokes the hilt of a knife at Judas' back, as if trying to push him out of the picture. Judas, alarmed by Jesus' words and menaced by Peter, is leaning backwards, away from Jesus, and bending over the table, away from Peter - but he cannot fall out of the picture, for the table prevents him. Judas is the one who will betray Jesus, and therefore the other disciples look at him, point in his direction, and menace him. On the other hand, Jesus will die for the sins of all men and not just because of Judas; God's plan requires the betrayal of Jesus, and therefore Judas belongs to the fated community of the Last Supper and for that reason is held firmly within the picture by the bar of the long table. Jesus, knowing who will betray him, does not seem angry with Judas; he simply looks away, sadly lowering his head and eyes. In my opinion, Leonardo's Last Supper raises a philosophical question: Do we have, or do we not have, free will? Did Judas act according to his own will? or was he just fulfilling a part of God's plan? Do we have free will? or is our will determined by the many laws of biology, psychology, economy, and so on? Only God knows the answer. We humans will always find arguments for one point of view and for its opposite. All we can do is to consider both of them, in spite of their inevitable contradictions. 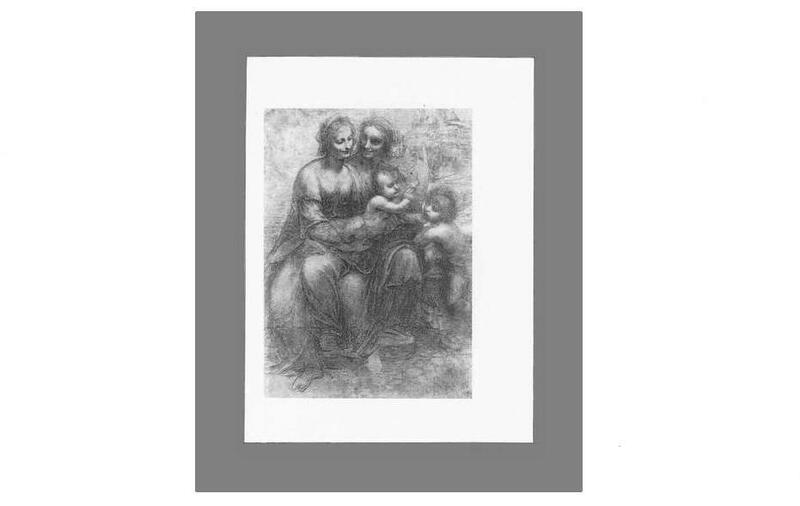 Now let me demonstrate to you how Leonardo discussed this philosophical problem not only in the drama of his wall-painting, but also on the levels of geometry, architecture, and possibly - and surprisingly - even on that of music. In these numbers are seen the octaves 24:12:6:3, the tierce 12:8, and the fourth 8:6. The radius of the arc above Christ's head measures 1 unit. Relying on Brachert's work, I discovered an ideal geometry embracing the virtual and actual room (see my drawings). Here I consider only the ideal geometry. (Large scale realizations of a geometrical model interfere with the idiosyncrasies of visual perception and require minor modifications, which are neglected here; I speak always and only of the ideal scheme). Jesus holds the top of a large pyramid (base 12 units, height 6 units). A pair of large arcs (radii 4 units) remain on the floor while touching the walls and the small painted arc above Christ. Smaller circles (radii 4 units) rolling on the frame seize and move the disciples and explain their arrangement into four groups. Complete the arc above Christ, making it into a circle. Its center lies on Christ's forehead. Its radius measures 1 unit. Now consider the square defined by the vertical line of the arc, by the rear line of the table, by Peter's finger, and by the left line of the window frame between the left and the central opening. One corner of the square lies in the palm of Christ. Compare the circle and the square: they have the same area. 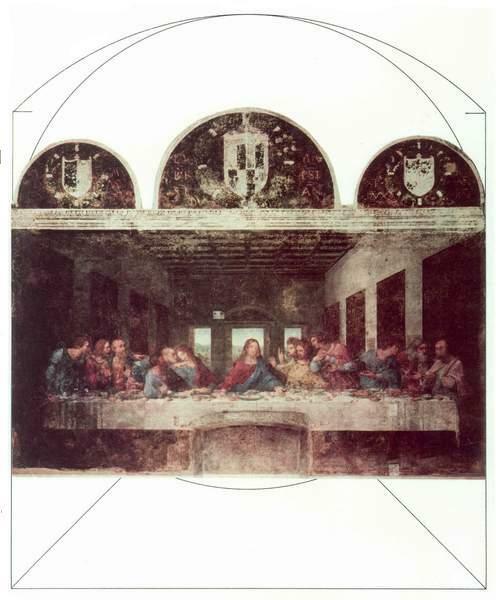 Leonardo tried in vain to square the area of the circle. In this famous wall-painting he assigns a solution to Christ, as if saying that only He can comprehend what we humans fail to understand. The virtual room of the painting prolongs the actual room (the former refectory). Brachert's grid 6 x 12 appears again in the coffer-work ceiling of the virtual room: 6 x 6 panels are visible, 6 x 6 further panels are concealed; together we obtain a grid of 6 by 12 squares. Now please have a look at the lines of the perspective: ideally, all the long lines would meet in the center of the picture, yet seen from every accessible point of view only some lines continue, while the others bend. If we could rise to a height of some 450 cm above the floor and take a position opposite Christ - being his equal, so to speak - the long lines of the actual room and those of the virtual would align perfectly; but as long as we remain on the ground only some lines arrange themselves well, while others bend. There is always a break between the two perspectives. We stay on the floor and look up to a table standing high above our heads - and yet we see down onto the table. Here we again have two perspectives: one from above, and one from below. We understand each, but we cannot really connect them. Now let me return to the musical proportions of the painting. The dark areas and bright openings of the rear wall provide the following numbers (29 parts equal 2 units, numbers of dark areas underlined): 9 6 8 12 8 6 9 These numbers comprise the octave 12:6, the tierces 12:8 and 9:6, and the fourths 12:9 and 8:6. The rectangle of the rear wall above the bright openings measures ideally 1.4 by 4 units. Multiplying the numbers by a factor of 5, we obtain the rectangle 7 by 20. This rectangle has a very special property. Consider the long side 20 to be a string that, if plucked, would vibrate in the note f. Now consider the diagonal 21.189620... (square root of 20x20 plus 7x7) as a string of equal tension: if plucked it would vibrate in e, according, however, to the tempered scale (equal steps from one to the next half-note). Divide the square root of 449 by 20 and you will obtain 1.0594810... which is very close to the twelfth root of 2 = 1.0594630... the minute mistake would be undetectable by the human ear. 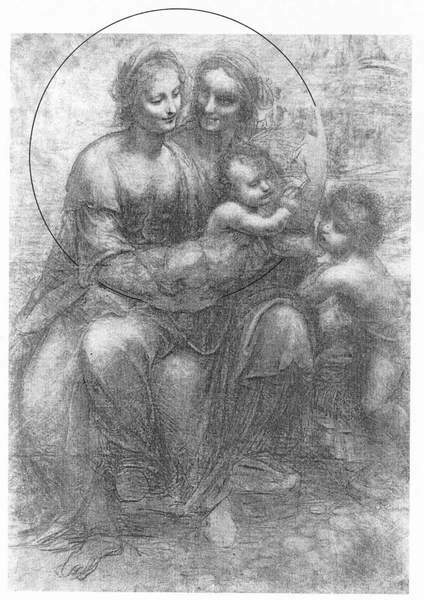 Leonardo was famous for inventing and playing several instruments; may it be that he also conceived of a tempered scale?